Long gone are the days of simply asking someone to Prom in the hallway before class. Lots of students are asking their date to Prom in a cute way. Whether it is stuffing their locker with ping pong balls, chalking their car or giving them flowers, “promposing” is a big deal. You have to admit it is adorable to watch, whether you are a fan of promposals or not. “I already knew we were going together. She just made me ask in a cute way,” junior Justin Holtz said about his date, senior Kaitlyn Stark. 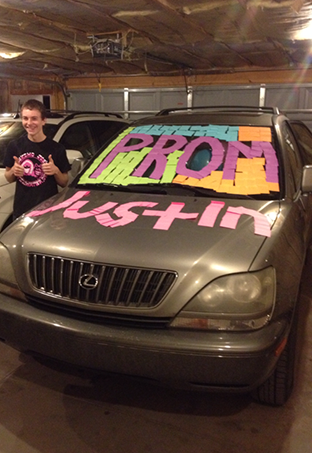 Junior Justin Holtz asks senior Kaitlyn Stark to Prom by putting sticky notes on her car and filling it with balloons. Creativity is a major element in the art of promposing. Junior Blake Lee asked his date, senior Mycha Owens, to Prom through a fortune cookie. “It was exciting when she said yes, because I wasn’t sure how it was going to work and then when it worked well it was just really exciting,” Lee said. Other Prom grooms weren’t as fortunate. Sometimes promposals just don’t go the way they hoped or planned they would. Junior Joaquin Corona was told no when he promposed to his classmate. “I will never do anything like that ever again,” Corona said. Corona is now taking Skyline alum Janessa Davis to Prom. You win some and you lose some, but no matter who you go with, Prom is always a night to remember. There are 28 days left until one of the biggest nights of the year. Are you ready?